Autophagy | Apoptosis & Related Products | BioVision, inc.
Autophagy works as a cellular housekeeper by eliminating defective proteins and organelles, the prevention of abnormal protein aggregate accumulation, and the removal of intracellular pathogens. Such functions are likely critical for autophagy-mediated protection against aging, cancer, neurodegenerative diseases, and infection. It is a bulk degradation system that delivers cytoplasmic constituents into lysosomes and the clearance of old/damaged organelles, long-lived proteins, insoluble protein aggregates and lipid droplets. This enables the reuse of intracellular constituents such as an amino acid pool during periods of starvation and regulates cellular homeostasis, cell death/survival, and lipid metabolism. Autophagy can be divided into three main forms: microautophagy, chaperone-mediated autophagy and macroautophagy. In microautophagy and the mammalian-specific chaperone-mediated autophagy the lysosome directly engulfs small portions of cytosol or receives chaperone-associated cargoes, respectively. 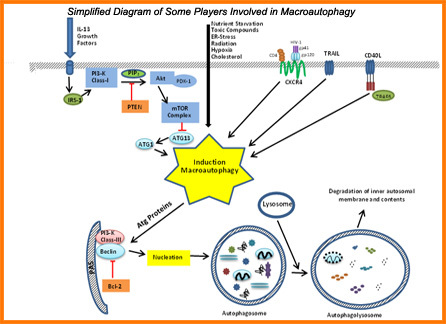 Macroautophagy involves the autophagosome, a double-membrane-bound vesicle, which fuses with a lysosome to form the autophagolysosome, which is responsible for the turnover of organelles (e.g., mitochondria) and portions of cytosol. Autophagosome formation is mediated by the coordinated action of autophagy-related genes (Atg's). Studies in yeast have resulted in the discovery of over 30 Atg's. More recent work has identified their mammalian counterparts, such as ULK1 (Atg1), Atg3–5, beclin-1 (Atg6), Atg7, LC3 (Atg8), Atg9a, Atg10, Atg12, Atg13L, Atg14L, Atg16L1, FIP200 (Atg17), and WIPI-1 (Atg18) and denote that Atg's are highly conserved between yeast and mammals. Antigen presentation, innate immune signaling, and pathogen degradation may all involve autophagosome recruitment and activity, which suggests autophagy, plays an important role in immunity and defense against infectious diseases. However, defects in the autophagic response has been linked to a significant number of human pathological conditions, which in turn, have been linked to the mTOR, PTEN/PI3-K, TLR pathways, and innate immune responses. Many neurodegenerative conditions can be traced back to defects in the autophagic response. The role of autophagy in Huntington's disease, Parkinson's disease, Amyotrophic lateral sclerosis, or Alzheimer's disease may reside in the failure to clear aggregates of mutated toxic proteins. Autophagy has also been identified as a crucial process in oncogenesis and cancer progression. Several autophagy-related proteins have tumor suppressor activities (Beclin-1, Atg5, Bif-1, Atg4C, and UVRAG). Some mutations in the autophagy-related genes (detected in humans or induced in cellular or animal models) appear to result in an accumulation of DNA damage and genome instability. Several reports have suggested that later, as a tumor grows, cancer cells may need autophagy to survive nutrient-limiting and low-oxygen conditions, especially in the internal region of the tumor that is poorly vascularized. Autophagy may also protect some cancer cells against ionizing radiation, possibly by removing damaged macromolecules or organelles, such as mitochondria, which could protect against apoptosis and allow continued survival of transformed cells. BioVision offers wide range of autophagy inducers and inhibitors as well as antibodies against autophagy related proteins.